$.31 cent ice cream. Can't say no to that. 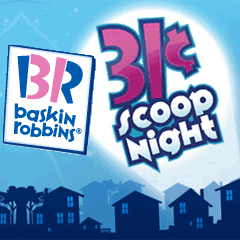 Join us for 31 Cent Scoop Night at Baskin-Robbins® and help us honor America's firefighters. The Baskin-Robbins CommunityFoundation is donating $100,000 to the National FallenFirefighters Foundation™ (NFFF). Participating stores will reduce prices of ice cream scoops to 31 cents*. At some locations, you may also have an opportunity to make a donation to your local fire charities.